Many people were already in the church when I arrived about 11:00 p.m. on Saturday night. On the carpet in the transept opposite the choir several blankets and children were laid out. I bought a fat candle to have ready for the procession, but it wasn’t lit until an hour later, and in the meantime I was getting intoxicated by the honey-warm scent rising to my nose, feeling as though I was already breaking the fast with some rich dessert. It smelled richer than baklava. Then the Easter lilies came into olfactory focus, blending with the beeswax. By this time my ears were full of the hymns reminding me of Christ’s rising from the tomb, in a garden, in a real place on the earth, because He was really a man of flesh and blood as we are. When He rose He must have noticed whatever flowers were blooming in that garden. Families were arriving, and while most males were dressed in their “ordinary” best Sunday clothes, the clergy wore white vestments, and many women and girls had put together very springy and bright, often all-white, outfits. A score of little girls had flouncy skirts that would have been fancy enough for a ball, or for acting the role of a fairy in a drama. I was so happy for their being able to commemorate their Lord’s Resurrection by being their prettiest. Even I had found a long and full eyelet skirt at a discount store, to wear with an odd assortment of other white things, and switched from black to flowered purse. There were lots of us, then, adding our white forms to the press of bodies, including the Eritreans who always wear beautiful white gauze. On this day more Eritrean men than usual wore their white gauze, too. When the deacons and priests started around with censers, it was with the incense that is so heady I want to cry over it, knowing that “Jesus is fairer, Jesus is sweeter….” Is it made from roses? I must find out about this. When we made our procession around the property — it was a longer route than merely around the church building — yes, there was some drizzle, but very fine, and not enough to put out anyone’s candle. We were singing our new Paschal processional hymn, which the choir tried to teach the rest of us last week, but I know I didn’t get it. Several of us noted as we were trailing along silently, too far behind in the train to hear the choir, that it had taken us ten years to learn the old Paschal hymn; it would have helped to have the choir members scattered along the line, interspersed with the rest of us and leading us. But I think everyone was content. We were at Pascha! At one point we who were closer to the front of the long line could see across the lawn to a stream of worshipers at the end of the procession, and the view was stunning, their white garments reflecting the flickering candles they were holding up in the dark. There were hundreds of us! I didn’t think it seemed that crowded in the building. This year our Father Michael, who is over 80 years old, read the homily. Somehow his voice never weakens, and retains the strength and authority of a strong spirit. Every time he serves or preaches I am so thankful for the grace that enables him to keep going, because he is so dear. His heart is such that the message of this sermon is of the sort that would flow from his own pen and lips. At every repetition of the phrase, “Hell [or it] was embittered,” Fr. Michael paused so that the congregation could answer with a shout: “It was embittered!” — a sort of boisterous participation that we all seem to enjoy this one time in the year. If anyone is a grateful servant, let him, rejoicing, enter into the joy of his Lord. If anyone has wearied himself in fasting, let him now receive recompense. If anyone has come at the third hour, with thanksgiving let him feast. If anyone has arrived at the sixth hour, let him have no misgivings; for he shall suffer no loss. If anyone has arrived even at the eleventh hour, let him not fear on account of tardiness. He embittered it when it tasted His flesh! And anticipating this, Isaiah exclaimed: “Hades was embittered when it encountered Thee in the lower regions“. It took what it saw, but crumbled before what cannot be seen! As I finish this post, it is Bright Tuesday. I went to church, and the gospel for today was the story of Christ meeting some of His followers on the Road to Emmaus soon after His rising from the dead. The unfolding of the scene, and imagining the Lord walking alongside and hearing them telling about the recent events — then their eyes being opened, His vanishing from their sight…. They said, “Didn’t our hearts burn within us?” And I got chills. The altar is open all during Bright Week. Christ is Risen! 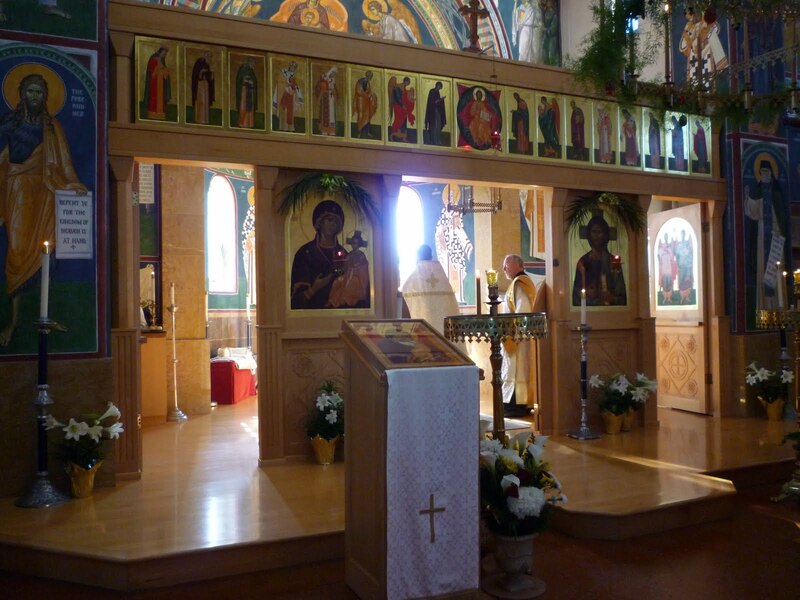 Yes, the beauty of Pascha cannot compare! Loved the inclusion of the flowers. 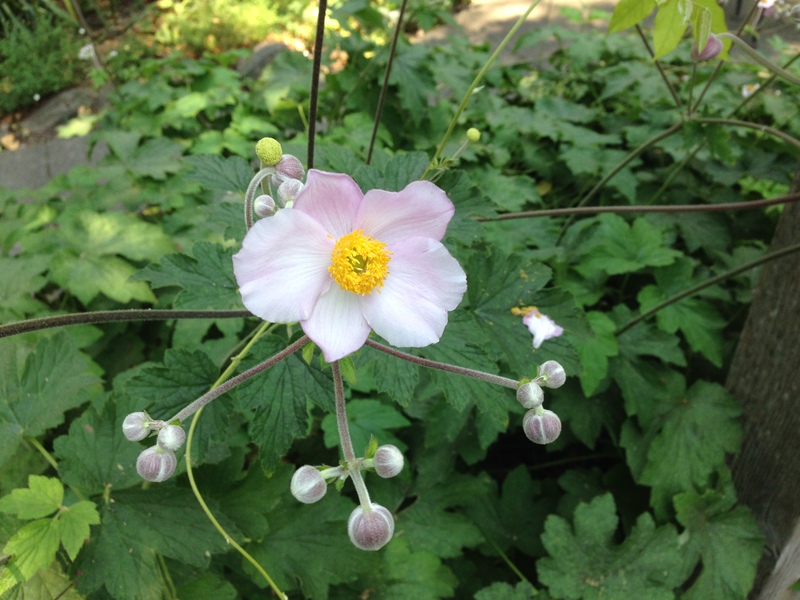 It seems that every year, the Bleeding Heart in my garden blooms at Easter, even though the date moves every year. It warms my heart to look at it and consider it my own private little Pascha miracle. Blessed Pascha to you! This was a wonderful post! What a wonderful account, GJ! I loved the smells and the sounds of it. Almost like being there with you….thank you. “Didn't our hearts burn within us?” is one of my favorite phrases from the NT. I also love to see how everyone has put on their finery for such a wonderful and special occasion. Even the little ones who are splayed out fast asleep on the floor in their Easter best is adorable. And we have women wearing white gauzy coverings, although I thought they were Ethiopians. Either way, they are so beautiful. Thank you for sharing your experience. Deb, they are likely Eritreans, as 1/4 to 1/3 of the population was forced to leave in the late 20th century due to war and drought. Eritrea had been annexed to Ethiopia at one time but has recently become independent. These links were helpful to me just now…Many of the Eritreans in our church lived in Sudan for a time before coming here. I only tonight noticed the bad grammar of the translation as I had first pasted it in — what we heard at Pascha did not put singular subjects with plural verbs! So I fixed it. 🙂 Sorry about that. A beautiful account…a wondrous occasion I am happy to share with my Orthodox brothers & sisters! 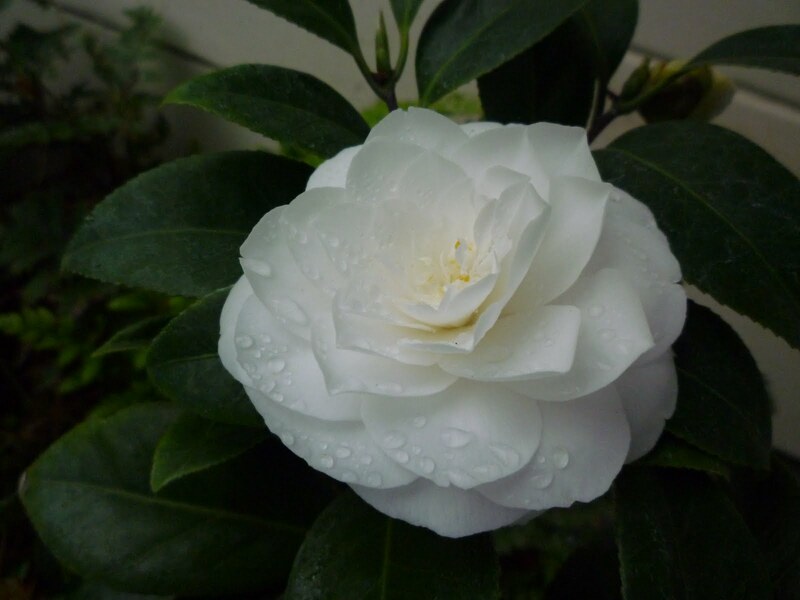 Sounds beautiful (would love to see everyone in white) and the camellia is exquisite. Yeah it was wonderful! Enjoyed this. Love your iconostatis and painted walls. And I was too far back in the procession to hear squat, too. I like your idea for the choir… but must be a better option. Thanks for taking us with you to the Anastasis at your church. Beautiful, and moving! I felt it with you all over again. Yes, it is a Day without night! This is filled to overflowing with celebration of Jesus and the Resurrection and to how some give occasion to this very special time of the year. I liked the white clothes, such meaning. And the proclamation, I can imagine his voice growing with intensity with those words.